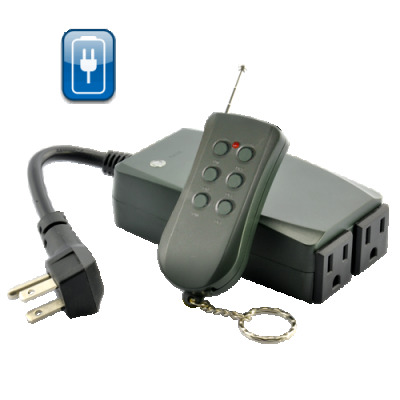 Successfully Added Weatherproof Outdoor Remote Control Power Switch (US) to your Shopping Cart. Remotely control your outdoor security lights or holiday decorations while you are inside the house or your car with this Weatherproof Outdoor Remote Control Power Switch. This practical handy product comes with a wired base which has two three-prong outlets and a remote control that has a working range of up to 30 meters. Simply plug your lights, home appliances, or other devices into the base, and start to enjoy the convenience of remotely turning them on or off. Even better, the power switch unit allows you to use (and control) two electronic devices simultaneously. This convenient Weatherproof Outdoor Remote Control Power Switch is now in stock for immediate shipment worldwide and is offered at a direct-from-factory wholesale price. Suitable for both personal use and resale. Order yours today and it will get shipped within a day. From the leader in high quality low price electronics, Chinavasion.